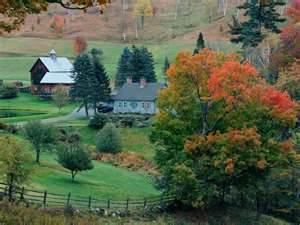 You are currently browsing the Suburban Homesteading – Frugal Living blog archives for May, 2012. Well folks, we did it. We finished our last show of Brianne’s 10-year sheep showing career this past weekend with a two-day show and we ended it on a high note. 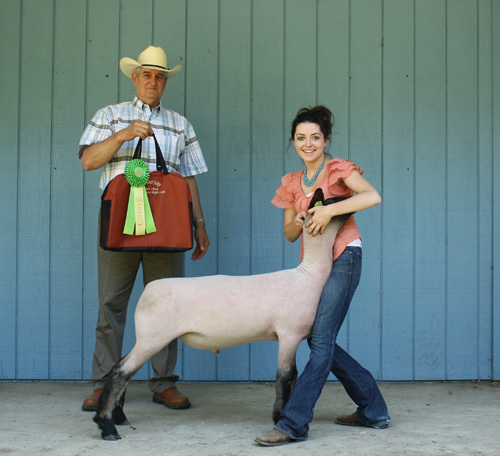 She won 2 Reserve Champions with each one of her lambs and placed second to the top showman in the state in showmanship both days. I couldn’t have asked for better. It seems like only yesterday that this shy little girl stepped into a livestock show arena for the very first time; untrained, unsure, unaware of how this livestock show thing worked. 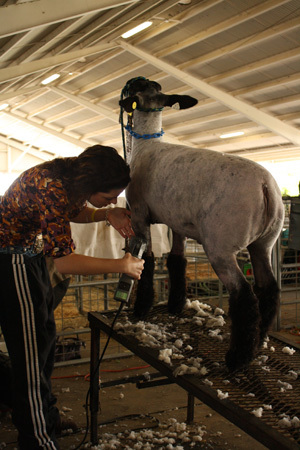 But, over the years she has gained confidence, knowledge about raising livestock, skills in presenting her animals to their best, respect from fellow competitors and made a ton of friends along the way. We have traveled thousands of miles over the years, shown in some of the worst weather California could throw at us and come out the other side strong, committed and even more dedicated to what we were doing. It isn’t all about buying lambs and winning prizes. It’s about building a foundation for what Brianne wants to do in her adult life, and clearly that will include raising sheep. At the end of the weekend our friends took one of the lambs north and delivered it to its new owner, a friend up north whose daughter will take it to the state fair. The other lamb came with us and was dropped off to its new owner, a friend who will show him at our county fair. 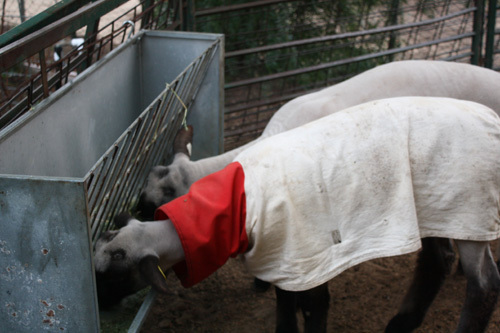 It was strange though, coming home with an empty trailer, no lambs to settle back into their home, no equipment to unload, clean, reload waiting for the next show weekend, and when 6pm rolled around we hardly knew what to do with ourselves. We usually feed at 6 then work on showmanship in the cool of the early evening, but not this night. It was oddly quiet. Sure there where chores we could have done, projects we could have worked on, but our routine was out of sorts, broken. The block of time set aside each night for sheep related tasks was empty and silent. But, life is all about change and we have to change with it or become stagnant. So now Brianne is going in her direction…an internship with an agricultural company, then off to college in August. After that who knows what the future holds. She wants a farm of her own, a flock she can hold on to and not sell off after each show season that much I do know. She is already connecting with large breeders she can work for while in college and hopefully work with when she is finished. In the short term I’m taking back my farm starting with a new batch of meat chicks and a greenhouse, then moving forward with new garden areas, fruit trees and more vegetable beds, and raising a pig for the freezer. There are plans in the works, laying the foundation to move from my little suburban homestead to a larger farm, but for now those are only plans rolling around in my head. When I look at the horizon I see a world of possibilities, not next weekends show. How quickly we change and move on. It’s been a long ride, folks, and a good one. I wouldn’t have changed it for anything. I am anxiously awaiting the arrival of a new batch of meat chicks. My friend and fellow 4-H mom Angie was kind enough to let me tack on a dozen Cornish Rock crosses to the meat chick and turkey order she places each year for her kids’ county fair exhibit. Just in time too. I only have a few half chickens left in my freezer from last year. But, by August Sandy and I will back at it—butchering, cleaning and packing a years worth of chicken for this soon to be one person household. There is a lot of controversy over what breed makes the best meat chickens—Freedom Rangers or Cornish Rocks, but, when you are trying to make your suburban homestead as efficient as possible growing times matter. From vegetables to trees and berries to flowers and meat animals I choose varieties based not only on their taste and appeal, but those with the shortest growing times as well. It’s what allows me grow a wider variety of food for the house. Yes—the Cornish Rock is probably the ugliest farm animal you will ever raise compared to the Rhode Island Red style cuteness of a Freedom Ranger. And who wouldn’t like to see a flock of little red birds roaming around pecking through a bright green pasture, but honestly I don’t have a 12 to 14 week span of time to wait for the Freedom Rangers to reach a butcherable weight, and I don’t mean a heavy weight, just an average weight. At that age, a Freedom Ranger will weigh 4 to 6 pounds. In that same amount of time though my Cornish Rocks would be pushing 9 pounds, with some topping 10. I jokingly tell people I have the three bag poultry project because it will take about three bags of feed to get my birds from chick to freezer. Not a bad use of time, energy, resources and money, don’t you think? Don’t get me wrong folks; I’m not bashing the Freedom Ranger in favor of the Cornish Rock. I think they both have merit and their place in the world. But, given my circumstances (and I’m sure I’m not alone) the shorter start-to-finish growing time of the Cornish fits well into my little homestead. The question shouldn’t be so much what you raise as it is how you raise them and the quality of product you have at the end. 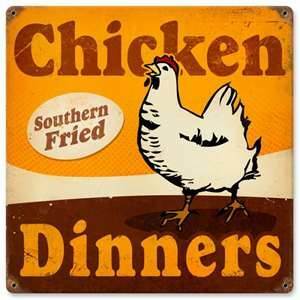 I can tell you this for sure…no matter which breed you raise a homegrown chicken is far superior to any store bought. The meat is denser, juicier, more flavorful and strangely enough take longer to cook than any store bought chicken. Perhaps some day, when a larger farm comes my way and I have the space to let a flock of meat birds roam the pastures I will take the time to raise a batch of Freedom Rangers and do a side-by-side taste test to see which I prefer. But for now, time and space factor in heavily to what I grow. And for that I make no apologies. Raise what works for you and enjoy your chicken dinner. The growing season so far has been unlike any I’ve experienced. Late into spring we’ve had days covered in clouds, drizzly, blustery with temps in the low 60s and highs in the 90s, sometimes all in one week. I wonder if this is what farming looks like in other areas of the country. Seeds I planted back in March are finally producing an edible crop. Some, like tomatoes, squash and of course the treasured pumpkins are big enough to plant out in the garden. Seedlings of cucumbers, cauliflower and broccoli bolted in the short heat wave we had and have been replanted, but not big enough to be planted out. I have to keep telling myself it’s just May and in some parts of the country it’s just now time to sow seeds in the ground. My garden plans are grandiose this year. With the lambs just a week away from being sold and our final show season all but over my mind has turned to other projects that have been on the back burner for the past few years. One of the biggest is a greenhouse, something I’ve been dreaming of for a long time. My neighbor Scott recommended Jordan a local handyman and part-time builder who loves to work with vintage anything and reclaimed materials for interesting building projects. When I explained what I was doing he was instantly onboard, and he completely understood the “girl thing” that it had to be functional AND cute. What a guy! The greenhouse/potting shed will be built out of old wood frame windows I found at a local second hand store. The front door is a great old Victorian style with lots of intricate detail. Below the windows will be siding of galvanized tin roofing material. I was able to buy all I needed from craigslist for a few dollars per sheet. 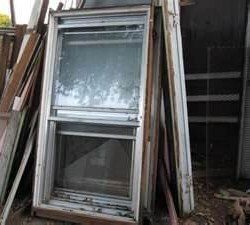 It’s used and the old scuffed and rusted areas will add to charm to the greenhouses look. The only materials that will be new is the fiberglass roofing. Even the rooster wind vane that will adorn the roof is more than 25 years old, a treasure I’ve been carrying with me from one house to another. The back side of the greenhouse, which faces the back of my property, will be solid siding. I will use this area to hang and store long-handled tools like shovels, rakes and hoes. The inside I will build out myself. It will have a sink area with running water, shelves for newly planted seedlings and storage for potting soil, pots, hand tools, plant labels and all the other interesting gardening gadgets I’ve collected over the years. I’m looking forward to having all my gardening supplies in one location. But, more than that I’m looking forward to having a quiet, tranquil place to plant seeds, plan my garden and watch everything grow from the comfort of a small patio just outside its walls. It’s been a long time since I’ve taken on a project of this size, but I’m looking forward to it. And, with Jordan’s help my dream should become a reality with just a few long hard days of swinging a hammer and cutting lumber. I’ll post our progress and the finished product in all its vintage glory. So lift a glass and celebrate stepping out and getting it all! No matter what your “everything” looks like. No fear. Taking back a life and a farm is no easy task. It starts early, lasts till dark and cleanses the body with sweat. My “take back” plan started in the quiet pre-dawn hours of the morning. Over a cup of free trade tea I sat at my kitchen table staring out the window and thinking as all that needed to be done rumbled through my head. But none of that would get the job done, so I picked up my pen and started writing, making a list really of all the chores, repairs, tasks, errands that needed to be accomplished to get us back on track. When I had filled an entire page I stopped, a little overwhelmed by the shear volume. But when I realized the jobs were falling into categories like barn, garden, yard, garage, house I felt a little better. I could group the jobs by area and work on one area at a time with inside jobs being done in the middle of the day when it was too hot outside to work very long in the garden or yard. By mid-morning I had fed and collected eggs, planted and watered in 45 4” pots of pumpkins, squash, and tomatoes, watered 2 flats of sunflower seedlings, picked lettuce, radishes and spinach, fixed the water line to the fruit trees, repaired a few sprinklers, washed and refilled water fonts, water buckets and water bottles, scrubbed out and stored the water fonts used for the meat ducks, swept the front of the barn of cobwebs and dirt, cleaned the kitchen and thrown in two loads of laundry. I didn’t work at a frantic pace, I’ve had enough of that lately, but I worked steadily, moving seamlessly from one task to another like a dance of persistence and determination. As each chore was marked off the list I could feel the chaos and stress fade in my body and my mind. A short break and a much needed glass of Mason Jar tea gave me time to regroup, figure out my next step and, of course, add to the list. The sun was reaching high in a crystal blue sky and it was getting warmer, no sign of the storm reported on last night’s news. Some of our chores would need supplies which meant a trip into town. We were also low on chicken and sheep feed and I had a few errands to run too, so I decided this would be our afternoon break with lunch thrown in as a treat. I love living in a small town. I never have to go very far for the things I need. Some people think it’s boring, no energy and nothing to do, but there’s a different kind of energy in a small town. It’s steady and constant. I like it. When I had unloaded 300 pounds of livestock feed and put away the proceeds of my errands I set about repairing a water hose blown out during the duck butchering. Nothing goes to waste on a small farm, if it can be repaired. The worked continued…mow the lawn, clean the rabbit hutch, refill nesting boxes with bedding, bolt together another raised bed and fill it with cleanings from the barn and coop along with a healthy dose of garden soil and compost, a new home for salad greens and root vegetables. As later afternoon came we began to wind down. A late afternoon snack and drink, and a call from my sister inviting me to the movies brought our day’s work to an abrupt end. So much had been done and life was beginning to look normal again. After a quick shower and a change of clothes I’m off to see “The Best Exotic Marigold Hotel”. I think I deserve it. Besides, as Scarlett O’Hara famously said, “tomorrow is another day”. Hi folks. I know it’s been a while since my last post and I apologize for that. There has been so much going on around here that writing, which I love to do, has seemed more like a chore rather than the true pleasure it really is. 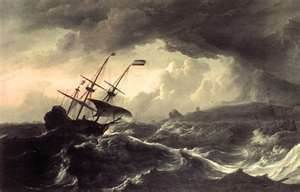 Have you ever had one of those days when work and school and kids and home and farm and future created the perfect storm of chaos that had your world spinning out of control? Well— we have, but not just a day. This has been going on since April. Some responsibilities can not be push off to another day, like college, scholarship and internship applications; job resumes and interviews; butchering ducks, working when the boss asks for overtime or attending livestock shows. They all have deadlines that must be met, while every other non-essential task like laundry, cleaning, gardening, dishes, grocery shopping…and writing on a blog take a back seat. Finally, though, the grey angry clouds seem to be dissipating and I can see faint rays of light streaming through. The storm, at long last appears to be lifting, albeit slowly. It’s been an interesting time, though, if not a busy one. It has served to galvanize my plans and my dreams of what the future will look like. It has shoved in my face, over and over, the chaotic, drone-like, unsatisfying life I DON’T want and pulled me more towards the life I do want for myself and my daughter. Life will not be totally calm, it never is when a child goes off to college, but it should be more manageable. We will take it one step at a time, one day at a time, always moving forward. And, the first step starts today. A day off work will give me a big chunk of time to rein in a life that has been bounced on the rocky shoals over the last several weeks and come out battered and bruised, but not broken. I have great plans working in my head, but I’m not ready to share them just yet. I hate to be a tease, but ideas and thoughts need to be worked on and fleshed out before they can be shared. Bear with me folks, life is getting back on track and we are taking back the farm. Literally. BLOG POST WARNING!!!!! 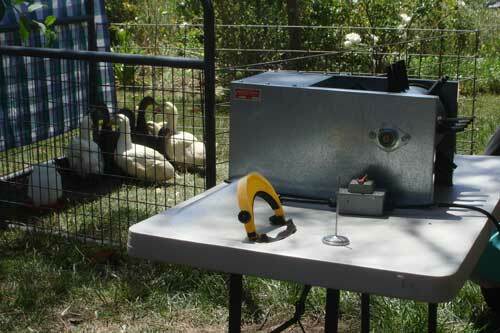 This post will chronicle the process of butchering our batch of meat ducks. If you are opposed to raising livestock for consumption this is NOT the post for you. It will be detailed and sometimes graphic. And—there will be pictures. Fair warning, folks, enter at you own risk. Today day started early. Actually, the butchering day prep started yesterday. Brianne washed and sterilized two large ice chests cleaned the area where the butchering would take place, used almost every plastic container we own to make ice and generally readied our farm to put home raised meat in the freezer. She did all this while I worked more than a full day at my job. Sometimes our farm life and work life collide in unexpected ways and life gets crazy busy. The morning was all about processing meat into meals, though. The ducks were pulled off feed the night before, but kept their water fonts so they don’t become dehydrated. Pots of water were boiling on the stove to give the scalder a head start at heating up. There were lined trash cans strategically placed near the killing and cleaning areas. Sandy will be here in about an hour with killing cones, scalder, and plucker in hand. We have set up our makeshift butchering area near the patio where there is easy access to water and power. We will work in assembly line fashion—from killing to scalding to plucking to gutting to cooling. The set-up means we can work quickly and efficiently to get each duck processed and in the cooler as quickly as possible. I have knives, scissors, cutting board and plastic tablecloth at the ready. They will be the last supplies to be set out before we start. Sandy and I have butchered chickens many times before, but never at my home. I’ve always packed up and brought the animals to her farm. So, today should be interesting, but we are as ready as can be and my set up doesn’t look much different than the arrangement we have at Sandy’s place. We had a bit of a rocky start to this day and ended it with a kitchen disaster. Such is life! Brianne jetted out the door at the crack of dawn to a cattle showmanship workshop and I was right behind her an hour later on my way to a garden tour. Needless to say our morning of French toast and homemade sausage never materialized. By 2pm though, we were back at the house and using last night’s lamb and leftover greens to make a delightful salad. I was so inspired by the tour and our new commitment to eat local that I swung by the farm stand on my way home to pick up mushrooms for an onion, spinach & ‘shroom quiche. I’ll use the extra spinach and mushrooms to make a spinach salad and toss it in vinaigrette made with avocado oil, Dijon mustard, lemon juice and onions. I got the recipe from a friend years ago and it has been on our summer hit list ever since; perfect on a spinach salad. Oh – and the egg for the quiche and spinach salad? Our girls of course. By the time the quiche was out of the oven, 35-minutes later, the dishes were washed and in the drying rack and the kitchen was pretty much cleaned of our cooking experiment. It’s time for dinner, putting my feet up after a long day and relaxing to our homemade meal. Hopefully, tomorrow I’ll get my French toast. Oh—great news on new finds in our county. Just over the hill is an organic honey tasting room; I’ve passed it for years, but never had a chance to stop…until now. I was able to taste about a dozen different kinds of honey, from citrus to sage to wild buckwheat. It was amazing the difference in strength and color seeing side-by-side. I bought a jar of citrus, which will taste great in tea and when used in some of my baked goods. I also found a small farm business on the other side of the county that presses their own olive oil. The drive would be a bit far (almost 40 miles) to buy the occasional bottle, but happily they sell at the Thursday Farmer’s Market. So far I’ve sourced milk, honey and oil locally. Not bad. Not bad at all. After grating onions place all ingredients in a food processor and blend well. Chill before using.